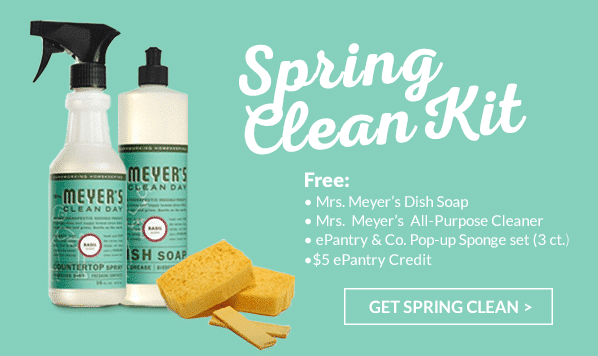 Tori Avey + @ePantry: Free Spring Clean Kit. 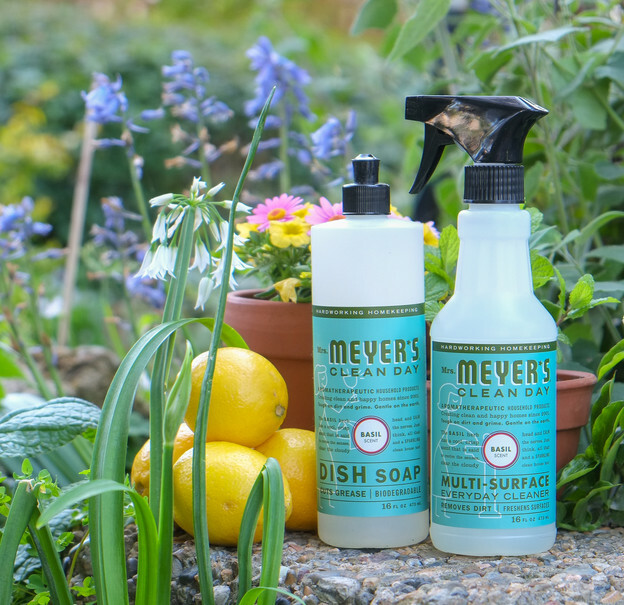 Mrs. Meyer’s Multi-Surface Cleaner, Mrs. Meyer’s Dish Soap, $5 Credit & Free Shipping, plus a $100 Giveaway! Update: My friends at ePantry are so excited about the response from my readers that they’ve offered to sponsor a $100 Giveaway! Receive $100 in ePantry credit to buy anything you like from their awesome selection of natural cleaning products. All you need to do is share this post on Facebook, Pinterest, Instagram and/or Twitter, then comment on this post and let me know where you shared it. Each time you share, you’ll be entered in the giveaway. And if you sign up for ePantry through this post, I’ll give you 3 extra entries! Plus you’ll get that awesome free Spring Clean Kit and $5 ePantry credit. If you’ve already signed up for ePantry through this post, you’re automatically entered 3 times. Share the post on social media for additional entries. Don’t forget to comment and let me know where you shared it. Good luck! As you all know, I am fascinated with the ritual of cooking, sharing food, and anything else that comes with it. Part of the ritual that is so important but not talked about enough is cleaning! Nobody ever made a great meal without also making a mess. It’s just the nature of the kitchen beast. Lately I’ve been doing a LOT of scrubbing, polishing and organizing. After all, it’s mid-April… spring cleaning time! Out with the matzo, in with the sponges and spray cleaners. Now I don’t mean to kvetch, but does anybody really have time for this? Let’s face it, life is busy. Between work, family obligations, and cooking up a storm, I don’t always have time to run to the store for dish soap- and when I do realize that I’m out, it’s almost always right when I’m about to do a sink full of dishes! I prefer using natural cleaning products which are harder to find, which complicates life even more. Enter ePantry, an awesome service that helps me find amazing products while saving time and money. ePantry is a small San Francisco-based company dedicated to bringing the best all-natural cleaning and personal care products, delivered straight to your door. As someone who is constantly in the kitchen, the all-natural factor is very important for me. I need to know that the products I’m using are safe for my loved ones. With my recently diagnosed thyroid condition, I’m even more conscious about the amount of chemicals in my home– the more I can keep things natural, the better. It’s like ePantry read my mind! 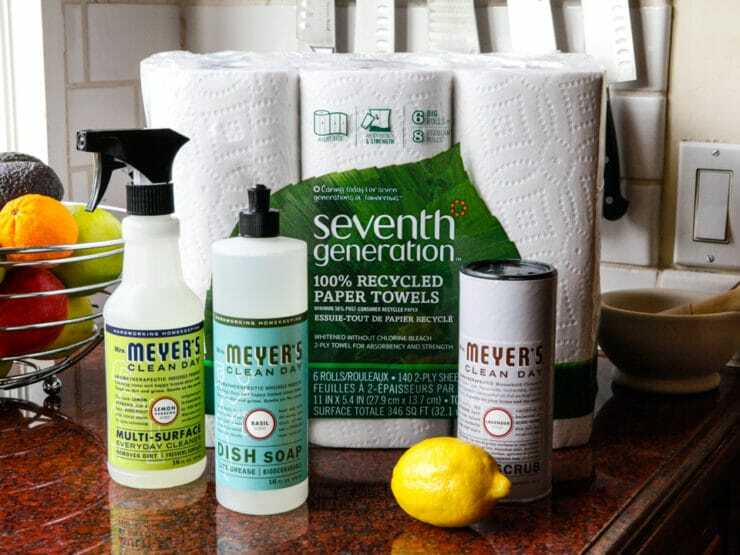 They carry a curated selection of some of my favorite cleaning brands, including Mrs. Meyer’s, Seventh Generation, method, Tom’s of Maine and more, all at great prices– much better than you’ll find at your local health food store. And here’s the really cool part– ePantry’s site helps predict what your family will need, right when you need it. 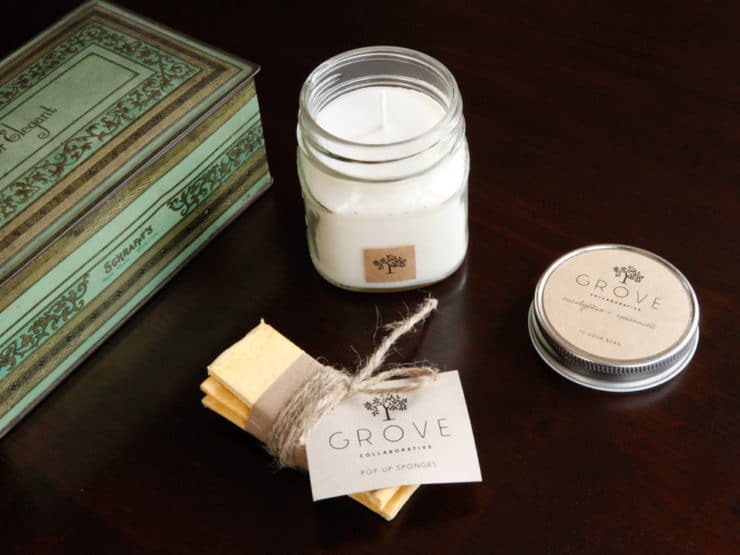 You can schedule future deliveries months in advance, or customize an order when you need one! It’s very flexible, and you can see why this service would be so helpful for someone who loves to cook! The Tori Avey Spring Clean Kit is only available now through April 26th so sign up by clicking here. ePantry will ask you a few questions about your household to get an idea of how often you will need products and what you like. Don’t worry, this info is totally private and is never shared with anyone else. You’ll land on your dashboard. 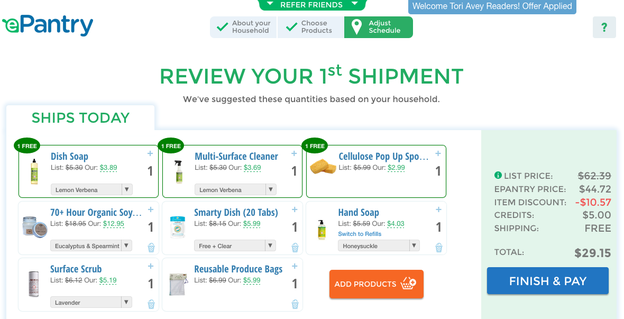 Here you can add or remove products – customizing your basket is the best part! Once your basket is set, click Finish and Pay. You’ll need to be at a final amount of $20 or more (that’s only for your first order). Sample Basket: One of the best parts of ePantry is the amazing value of the products. This sample basket shows that you can have a very well-stocked kitchen of cleaning supplies for less than $30! Of course, the most fun part is exploring ePantry’s full lineup. If you refer friends and family to ePantry, each person you refer will get $10 in credit for their first order! And, more good news! You will also receive $10 in credit for each person who checks out. It’s a win-win! 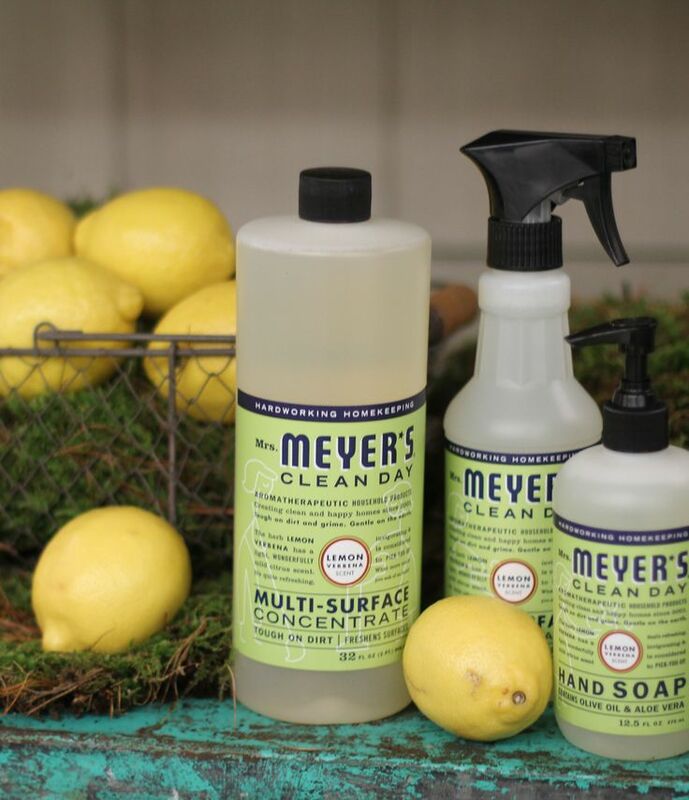 Healthy earth-friendly cleaning products, auto delivered at an amazing price… I love this whole concept. If you have any questions, head over to ePantry. The friendly Customer Service team is there to help guide you through the process. Sponsored by ePantry. Thank you for supporting my sponsors, they allow me to share more free recipes, cooking tips, home tutorials and food history with you! CONTEST CLOSED. Congratulations to the family of Glen & Kyle Mansberger, who was chosen via a numeric randomizer. New giveaway coming soon, stay tuned! Awesome recipes that I have been looking for. Good information about chemical free cleaning products. I am a 2X of 2 different cancers survivor, I am Blessed, and I am always looking for chemical free/ or less products. Shared on twitter and just made my first purchase!! I take it that this offer is for America onlunch and not for Israel. Sigh. Sounds excellent! I have always wanted to try these products ( and they smell better than vinegar ).